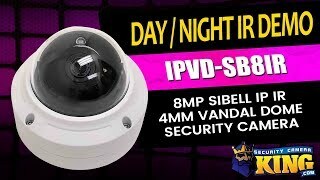 This 8MP IP camera from Sibell will give you truly amazing picture quality and a level of detail that is tough to match. The value of the 4K video provided by this camera is still relevant even without a 4K display due to the ability to digitally zoom into the images without that familiar pixelation or loss of detail. The IP66 and IK10 protection rating that this vandal resistant dome has means that it will be able to give you this incredible video while standing up to tough conditions inside or outside. The 3.6 mm lens gives you a field of view which is about 85 degrees horizontally and the 3 axis mounting arm allows you to angle the camera from the mounting surface to better help you get the overview you’re looking for. This camera also uses IVS features to allow a surprising level of customization for its motion detection based recording. These features use virtual lines to detect if something or someone has entered or left a predetermined area where you want this kind of focus. You can also simply draw a line and have a motion detection event triggered when someone crosses it in either direction or both. Pair this camera with a wall mount (WM-SB203) for a clean installation to protect the pigtail of the camera. You can find these to add to your order below, listed under the accessories section. You’ll get a 2 year warranty, FREE US based tech support and FREE remote viewing software with the purchase of this camera.